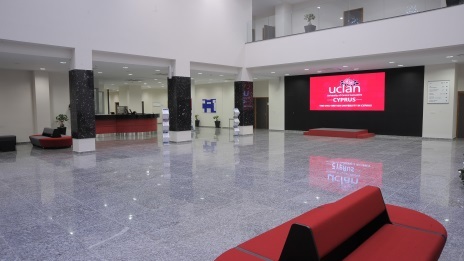 When a UK university established a campus in Cyprus it partnered with a local integrator to deliver a high-tech solution and a sophisticated Learning Information Systems network. The resulting installation topped the education category in the 2013 InAVation Awards. Last year the University of Central Lancashire (UCLan) in the UK extended its teaching facilities with another campus and introduction of a Learning Information Systems (LIS) network. An ambitious technology deployment was further complicated by the fact the new campus was constructed in Cyprus, 3,600km miles away from the university’s Preston facility. Cypriot integrator, ALA Equipment Co, handled AV fit out and implementation of the LIS network for the €53m campus, the first phase of the Cyprus facility, designed by architect, George Lyssiotis. In the planning phases ALA was instrumental in driving and developing the project with suggestions for a higher-tech deployment. With building works commencing in May 2012, and the campus required for use at the start of the academic year in the beginning of October, ALA had just four weeks to complete a €700,000 AV installation. Read full article in InAVate Active to find out how the company worked with IT network providers, Cytacom and building contractors, GCC to deliver solutions for a foyer area, theatre and 15 classrooms.